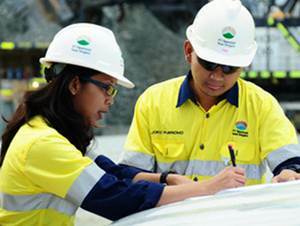 Lowongan Kerja PT Newmont Nusa Tenggara - PTNNT or widely known as Newmont is a trusted and reliable foreign investment (PMA) company focus on mining industry. PTNNT concentrates its business activities in the coper and gold mining industry. PTNNT having mining location in Batu Hijau Sekongkang West Sumbawa regency, West Nusa Tenggara Province (NTB). PT Newmont Nusa Tenggara is an affiliate company of world leading gold mining company, Newmont Mining Corporation (NYSE: NEM). At present, PT Newmont Nusa Tenggara is 56% owned by Newmont Mining Corporation through Nusa Tenggara Partnership BV (Newmont & Sumitomo). The remaining 44% shares in PTNNT is owned by PT Multi Daerah Bersaing (24%). PT Pukuafu Indah (17.8%) and PT Indonesia Masbaga Investama (2.2%). PT Newmont Nusa Tenggara was appraised by the Ministry of Energy and Mineral Resources of Republic of Indonesia and received Gold ADITAMA Award for its environmental management efforts in 2012. College-equivalent degree, majoring in Accounting. Show evidence of good level in English both oral and written. A minimum college degree, majoring in Environmental and/or science-related field. Certified of Competency for Frontline Operational Supervisor of OHS and Mine Environment from DEMR. Experienced in environmental compliance within the mining or similar industry. Understand on government regulations related to environmental. Strong computer skills and competent with Microsoft Office application (Word, Excel, Power Point. etc).